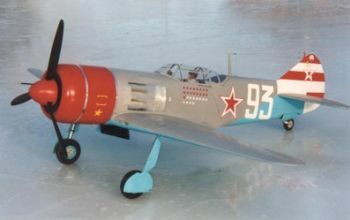 The Lavochkin La-7 was a high performance, yet simple to maintain Russian flighter. 40mph faster than a Focke Wulf FW190A8, it has been modelled here by David Andersen to 1/4 scale. At 96.5 inch span and weighing around 27-30lbs, this models suits 62 and up petrol engines. The Belair Parts Set includes around 230 parts all laser cut and marked with their plan numbers, including fuselage formers, bulkhead, wing ribs, dihedral braces, tail parts, undercarriage mounts, etc. Just add strip and sheet and start building straightaway - no labour. NB, this kit has been revised and around 25 parts added to the kit to increase the value of the kit and reduce your labour.